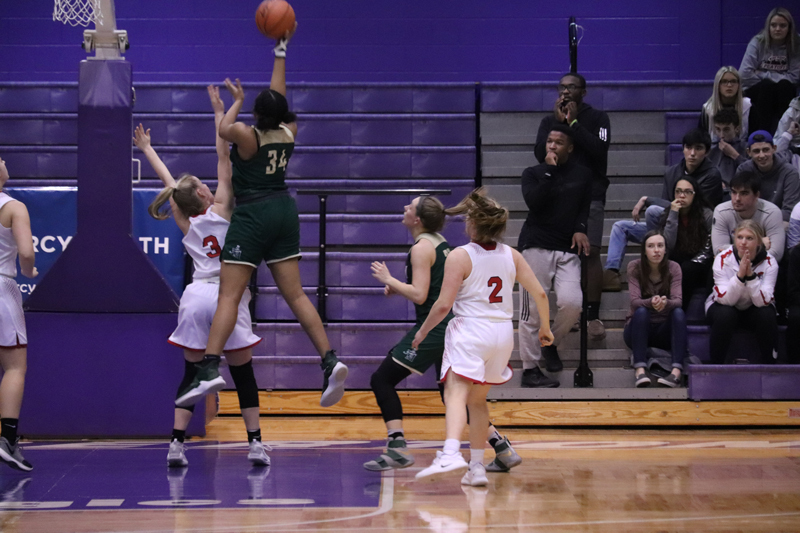 The fighting Irish face one of the most difficult schedules in Northeast Ohio each season to test their team and to make sure the Girls Basketball team is ready to navigate a run during the Ohsaa DII Girls Basketball Tournament. In Game one of the Barberton Regional STVM faced a game Perry team who came into the night ready to prove they belonged and to move one step closer to a State Final appearance. The Fighting Irish used their distinctive height advantage inside with senior Aubrie Marsh who chipped in 6 points for the Irish. For Perry three big 3’s and two from Sophomore Elle Infalvi gave Perry (21-5) the lead at the end of first 15-13. In the second half the Fighting Irish stepped up the defense and the offense in holding the Perry Pirates to seven points from two players. The strong 2nd quarter saw 20 points from the Irish with a strong quarter from Freshman duo Lanae Riley and Annie Watson with six and five points respectively. At the half STVM held a 33-22 lead. The third quarter was more balanced and even for both teams. STVM (17-9) went on a 5-0 run to start the third quarter and to pushed the lead to 16 with the score at 38-22 in favor of the Irish. With only two players scoring in the 3rd Quarter for Perry, the Irish held an 11-9 advantage for the quarter and closed the quarter with a 44-31 advantage. In the fourth Perry climbed back into the game thanks to the shooting of Elle Infalvi and down hill attacking style of Madyson Hacking. With 2:34 the Pirates cut the lead to 6 at 51 – 45 in favor of STVM. Down the stretch STVM hit timely shots on the inside and went 10/16 from the Free Throw Line to close the game at 60 – 52 in favor of the Irish.